This is a nice early Jumbo Tissot Antimagnetique. The diameter is 38 mm without the crown. Early Tissot watches, including the Antimagnetique, came with all kinds of evolutions of the Tissot 27, but this one has the base caliber. The serial number is 1010496 and that dates this watch to 1938 or 1939. 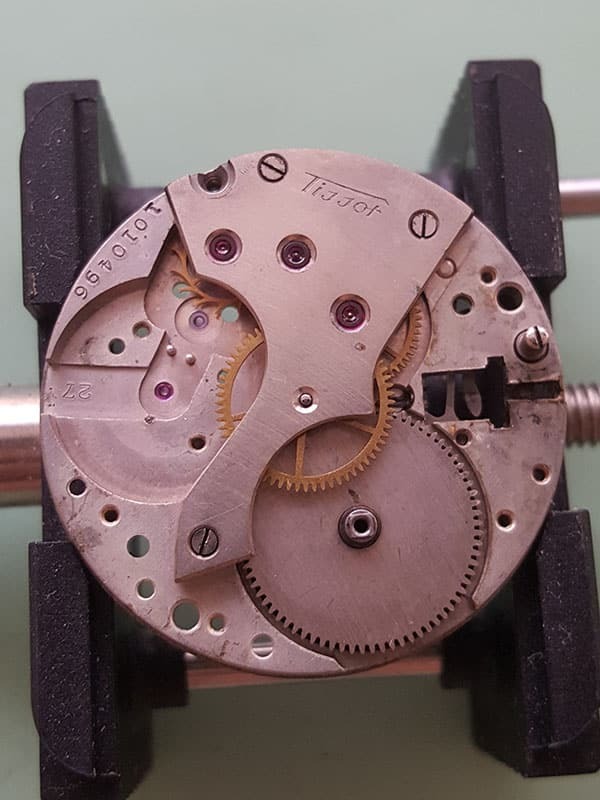 This Tissot needed a service because it was a couple of minutes fast, with the regulator in the middle position. It also needed a new crystal and a new crown. Forgive me for the broken watch strap that is also too small. Remove any power from the mainspring so you don’t damage the escapement or the wheel train. Carefully, let the crown slip between your thumb and index finger while you move the click away from the ratchet wheel. Remove the balance and the pallets. This cal. 27 doesn’t have shock protection, so you’ll need to disassemble the balance further. If you don’t do that, you won’t be able to inspect the balance staff or lubricate the cap jewel during the reassembly. Remove the hour wheel and the cannon pinion on the bottom plate of the movement. Without the cannon pinion removed, you won’t be able to lift the center wheel later. If you haven’t removed the winding stem yet, this is a good time to do so. There is a chance that the winding pinion and the clutch will fall out when you remove the winding stem. Remove the ratchet wheel, the crown wheel, and the crown wheel ring and lift the barrel bridge. Lift the wheel train bridge and then take out the wheels of the going train. Start with the center wheel, then the 3rd wheel, the fourth wheel, and finally the escape wheel. Remove the main barrel to complete the top plate of the movement. Flip the movement to the bottom plate and start with the keyless works. Lift the set lever spring and remove the return bar and its spring. Be careful because these springs can ping across the room. Use a peg wood or perhaps some Rodico to secure one end of the spring while you lift the other end away from the return bar. Remove the setting wheel and the minute wheel and also the winding pinion and the clutch if they aren’t removed yet. Always pre-clean the jewel holes, the pallet stones and the pallets crown with a sharp peg wood. This will loosen any hardened lubrication and remove a lot of the dirt and old oil and greases. The end result will be better and the cleaning fluids will last longer. Clean the parts in the watch cleaning machine. I use L&R #566 cleaner and L&R #3 rinsing solution. Start with the main barrel and the gear train. The main barrel still had the original “blue steel” mainspring so I ordered a new one. I installed it after the parts had been cleaned in the machine. Fit the barrel bridge, the crown wheel with the ring, and the ratchet wheel. Don’t forget to oil the crown wheel ring. I lubricate the center wheel with Moebius HP 1300 and the escape wheel, 4th wheel, and 3rd wheel with Moebius 9010. Turn the movement around and start with the keyless works and the motion works. I begin with the winding pinion and the clutch. Lubricate them where they make contact with three tiny dots of Moebius 9501. Lubricate the winding stem (not the thread) and fit it through the winding pinion and the clutch. Place the return bar and fit its spring. Lubricate the cannon pinion post and the setting wheel post with Moebius 9501 and fit the cannon pinion. Replace the minute wheel and the setting wheel and fit the set lever spring. Flip the movement to the top plate again to fit the pallets and the balance. Of course, the balance needs to be re-assembled and the cap jewel needs to be oiled before you replace it. Fit the hour wheel with its washer and replace the dial. I fitted a new crystal and a new crown. The winding stem was a little too short for the new crown. It was only a fraction but it was enough to cause problems with the keyless works. You could pull the crown to set the time but you couldn’t push the crown back far enough to reset it to the “zero” position again. I had to fit a new winding stem and trim it to the correct size. What do you think of this oversized Tissot Antimagnetique? Do you have an Antimag too? Tell me about it in the comments below. do you sell it ? I have the same watch, my father gave it to me tonight. I think it’s late 30’s. Was my grandfather’s watch, he wore it as the Germans marched into Poland. Mine is solid gold though. The dial is the same, I assume it has the same movement. I don’t want to open it yet, it keeps excellent time. What a great Christmas gift. Wear it in good health.